I think the map is improving with each iteration. 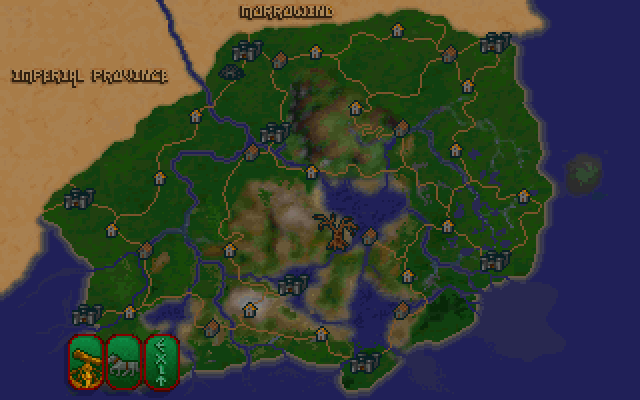 As much as I love Oblivion as the game that got me into TES, it sure has a wonky geography. I'll be commenting about it in my next post. Have some comments about names as well, but I'm not quite ready with what I want to say. I was about to say that there are not really any of the typical 'grad' townnames, until I discovered Mhorlagrad. Maybe you could have 1-2 more of these. I could add another village to the road south of Skingrad, that part of Colovia is supposed to be more populated. Let's call it Dethagrad. More villages than that will probably be overkill, in the west at least. COUNTY ANVIL has the major ports of Anvil, Stirk, and Sutch, the trade town of Brina Cross inland, and the smaller fishing villages of Thresvy and Seppaki. COUNTY SKINGRAD lies in a prosperous, fertile area. The proud cities of Skingrad and Sarchal are known for their vineyards, while the minor towns of Dethagrad, Brindle Home and Hal Uriel supply the Empire with wheat, cheese and meat. COUNTY CHORROL consists of inhospitable Highlands on one side, deep jungle on the other. Chorrol itself lies on the edge of the Highlands plateau. West of it is the town of Mhorlagrad, which supplies the nearby Fort Ontus, the Legion command in the west. Deep in the jungle lies the disreputable village of Hackdirt. To the north is the ruined hill-city of Sancre Tor, still home to a small community of pilgrims. COUNTY BRUMA is home to the cities of Bruma and Artemon. the only other settlement here is Bleaker's Way, a small town on the Brumathelion river. COUNTY CHEYDINHAL NORTH has several cities and villages around the edges of the dreaded Serican jungle. Larger cities are Cheydinhal and Cephoriad. The villages of Harlun's Watch and Culadiil lie to the south, as well as the temple-city of Nepenthe along Lake Poppad, known for its shrine to Vaernima. COUNTY CHEYDINHAL SOUTH features prosperous towns in the fertile Valley of Altars: Ato and Morihathiil are known for their cults and shrines, while Viatis and Ancra are more mercantile. The ancient and insular city of Mir Corrup lies to the east, in the toxic Iter Mir region. COUNTY LEYAWIIN has a very diverse population. The city of Leyawiin can be described as a twin-city, with Imperial and Khajiiti districts on opposite sides of the Niben river. Along the river are fishing and trading towns like Water's Edge, Blankenmarch, and Contramantarci, the ancient stronhold of the Caro battlemages. To the west lies Trariraj, also known as Border Watch, a Khajiiti community. To the east lie the villages of Moricta and Red Sutri, home to the clannish deepwood Nibenese. COUNTY BRAVIL is small, but populated: the sprawling city of Bravil is joined by the lesser villages of Alessiad and Buccita. 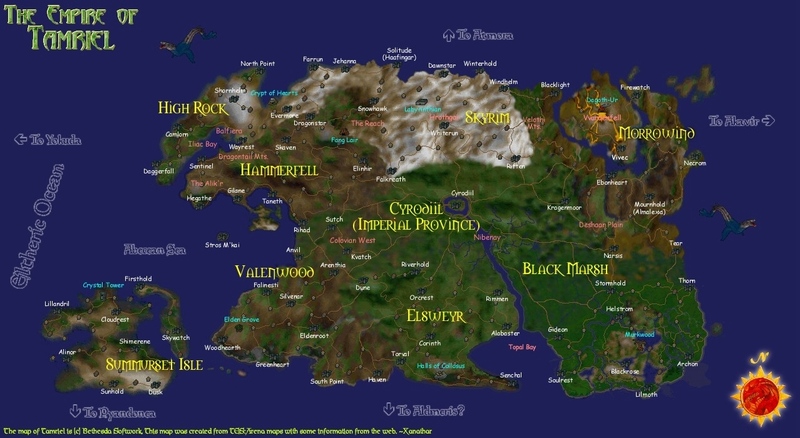 THE HEARTLANDS, then, are by far the most populated area of Cyrodiil, or even of Tamriel as a whole. The Imperial City, which is larger than eight other cities together, rises from lake Rumare. Around it are various large rice-farming and trading communities: the villages of Weye, Fax Aleshut, Quenti Turrai, Tiberiad, Rema, Pell's Gate, Kyntiriad and Delodiil. Couple of smaller changes: I've slightly tweaked the names of some of the newer regions: of note are Kvetchi Pass (instead of Pass of Kvatch), Massiqueran Forests, Serican Woods, and the Marshes of Mir. Also added the settlements of Dethagrad and Caer Suvio, which was mentioned in one of the lore books. Also messed around with the rivers and moved the borders of some of the regions, I think they make more sense now. Everything looks better and better with each iteration. Although, I did think "Iter Mir" sounded a bit better. Sounds more ancient and mysterious. Still cool either way. Also, I've been under the assumption that all the other minor colored squares represent the locations from Oblivion (caves, etc.)? How many of those in the Gold Coast represent locations in the current exterior file and how many are just planned locations? Also, is there a legend somewhere for what each of the different squares represent? Question: what happened with the road to Gideon (and the western one to Rockguard)? Do you assume there's a river network leading into western Black Marsh? Those roads did not show up in the map files I inherited from the people working on P:C before. That being said, the road network of the Nibenay is deliberately underdeveloped, as the east is said to depend heavily on river traffic. The inner jungle is difficult to traverse, dangerous, and some parts of it are forbidden. The road to Rockguard might still exist, but I don't think a road from Gideon to Leyawiin is feasible, given the region's terrain. River transportation actually makes so much sense in the region! Almost all settlements would be positioned near the water and should be reachable on boats. It's a nice touch. The wilderness probably will be much more dangerous since soldiers won't be able to patrol it properly. All life springs from the holy river Niben, so it is said. Well, Gideon had a road from Leyawiin since Arena, and the city somehow has to has travel connections to be able to sustain itself. A river connection works as well (even through the ocean), but do you have a fixed idea on how the river network you painted into the south would extend into Black Marsh? I think you're linking the wrong file, I can't see a thing on that map. As far as I know, Leyawiin doesn't even show up on Arena's maps, so I don't feel particularly bound to it. Ideally, this marshy mangrove area would spill over into Black Marsh - or the reverse, to be precise: it is said that miasmas and toxic things from Argonia tend to seep into southern Nibenay somehow. I've always taken this as meaning that this influence somehow travels over the waterways. Designs for Blackwood and the Marshes of mir have them as very watery places, where most travel is done by boat. There are some visual aids at the end of this post. Gideon has a river connection, has it not? In that case, most transport could go by Topal Bay. Maybe Gideon exploits a remote-port at the mouth of this river? Yes, that was the wrong file, sorry. I meant to link the Arena Blackmarsh one (note the roads) and the big one. Now that I'm squinting at the world map, I see that there's no road from Gideon west, it just goes into the sea. I'll just extend the waterways in the south a bit and add some connections to Rockguard and Glenbridge. Very neat then. Map Update, using the new cleaner and more accurate file resources from TR. This is still pretty much a WIP, but should be a good basis for new maps. I've played around a bit with the rivers, trying to make them more logical and wider with an eye on river traffic. Increased the size of some of the lakes. Before, they were barely wider than some of the rivers, which didn't feel right. It also emphasizes them in places where the lake is of importance, like Sutch or Mir Corrup. Some of the towns, like Brindle Home or Harlun's Watch, are labeled incorrect. I was thinking about proposing some name changes, but changed my mind just now. Not visible on this map, but I was considering two more changes to the region system: the removal of the proposed Luripylae and Topal Bay regions. Luripylae (a wilderness east of the West Weald) didn't really distinguish itself compared to surrounding areas, and the fact that it featured no settlements whatsoever and was close to the southern border meant that it wasn't really worth the effort. Topal Bay was supposed to be a mangrove swamp in the far south, but it likewise didn't really differ from Blackwood and doesn't have any attractions. Maybe Imperial city need his own biggest tier? Yeah, hose are placeholders. there's supposed to be six tiers of city sizes (metropolis-city-town-village-outpost-hamlet) but I couldn't be bothered yesterday. City icons are replaced with physical cell footprints of cities. Cell color denotes dominant culture/politics: blue cells are Colovian cities, green ones are Nibenese, red ones are Heartlands. Orange ones are special cases, such as Legion garrison cities or towns controlled by foreign interests. The Imperial Isles are divided (again). While it is still way too early to start developing the city, I think it makes sense to nail down some basic aspects of the city to be referenced by dialogue and quests. Various rivers, islands and lakes have received new names. I think cell impact is an excellent idea, but wouldn't get rid of city markers. No matter which ones you use, it helps identify the center of town as well as its tier. The Imperial Isle I like very very much. Your rivers, while plentiful, are incredibly narrow. I don't think they would work in-game. They are more like canals a normal person could hop over, and I'd suggest widening them by 50% at least. A new look for the Imperial Isles, newly divided. Accurate shorelines for Stirk and the Gold Coast. The proposed mine/quarry northwest from Kvatch has been named Thyra, for now. Massiquerran Forests now run all the way to the Elsweyr border, preventing an unsightly collision of multiple region types in this area and giving the southern border more character in general. I propose to change the name of Brindle Home to Vlastarus. It's city from Elder Scrolls Online which is roughly in the same spot. I believe the name sounds pretty good and definitely better than Brindle Home. Vlastarus is a town in southwestern Cyrodiil, southeast of Castle Brindle. I also suggest to add ruins of town Cropsford (or similar if name will be deemed too generic) in the Ora Demergatur region, next to yellow road, close to either the border between Imperial City "county" and Mir Corrup county(?) or maybe a little bit more to the west, next to the river. It is another town from ESO, but it's also a settlement that gets rebuilt during Oblivion, so it actually fits the theme of destroyed village in Ora Demergatur region, even though village demise is connected to Goblins and not flood in Oblivion. Cropsford is an under-construction farmhouse southeast of the Imperial City. Vlasterus is the name of a ruined fort east of Skingrad along the Gold Road. I was considering making it a small settlement or colo-nordic estate, but it is too far south to be confused with Brindle. Cropsford is too generic a name. However, the Demergator will feature many flooded villages as part of its basic design, so you are free to imagine one of these being the ruins of Cropsford. Added several small mines, hamlets, houses, temples, etc. locations based on Oblivion and on concept document. Added and (re)named Imperial Legion forts and outposts. Some locations from previous maps were moved or removed in coordination with the other provinces. Added some smaller roads and pathways based on previous design documents. Resized and reshuffled location of the Imperial Isles - should be more manageable and less stress on performance. Renamed Morihathiil to Moridiil due to lore reasons. Implemented Atrayonis' new location icons. Re-added all locations from previous maps.